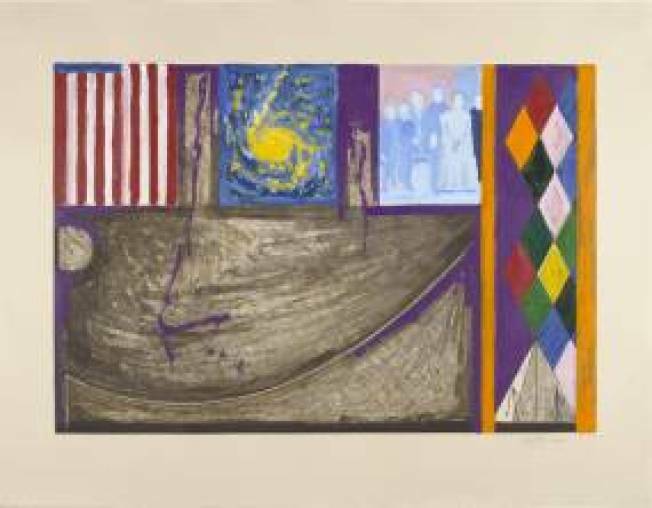 On of the newly acquired series of works on paper by Jasper Johns at MoMA. One man's trash is something another man hangs on the wall in a museum. Jasper Johns often reuses his reject pile to magnificent effect. MoMA's new exhibition, to celebrate the acquisition of a series 13 untitled compositions from 2001, is a characteristic exploration of the artist's nearly obsessive penchant to repeatedly plum the depths of a motif. For this series he used a batch of rejected and discarded prints to work on top of. In total, the exhibition displays a peek at the artist's creative process, and also includes variations and multimedia works from the museums vast Johns collection, including detailed progressions on targets, flags, numerals, Savarin, and seasons. The progression from "Flags I" (1968) to "Flags II" (1970) is especially illuminating. The newly acquired pieces, positioned in their own alcove in the back gallery, visit and re-visit his "catenary" theme, which refers to the curve running through the center of each work and is named for the curve formed by a string hanging between two fixed points. MoMA's Abby Aldrich Rockefeller Chief Curator for Prints and Illustrated Books Deborah Wye, who organized the show, calls them "unique works on paper" since they are neither lithographs nor drawings nor paintings nor collages, but contain elements of each. And each is a unique reinterpretation of the original lithograph beneath it. "At Museums, like MoMa," Wye explains, "we have our departments, but that's not how artists think." Johns told her he felt inspired when he received the rejected lithographs in the mail, and he began to "play" with them. When Wye remarked to him that "play" is a not a word people often associate with him, John's replied, "Play is not always that much fun."